ADI has united with CAS International, La Tortura no es Cultura and PiepVandaag to voice our opposition of the Spanish movie Blancanieves, a bullfighting version of Snow White. 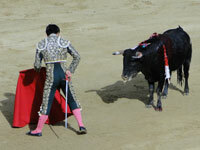 Several bulls have been maltreated and killed for the movie, which has been entered for the 2013 Oscars under the Foreign Language Film category. Please sign and share our petition calling for members of the Award committee to distance themselves from Blancanieves, and the promotion of animal suffering in this way, by not voting for the movie. Thank you.